Earlier today we sent the following e-mail to Councilmember Grosso, the Chair of the Committee on Education, and to all DC City Councilmembers. It does not outline a perfect solution, but it does move us past a truly horrible contract with Sodexo. The e-mail recommends amending the contract in a way that would allow DCPS to offer one cluster to an amazing upstart company called Genuine Foods. The text of the e-mail appears below. On behalf of The DC School Food Project, I’d like to thank you for the thorough, detailed hearing you conducted this week on the DCPS/SodexoMagic contract. You and the other Councilmembers asked the hard questions, and we in the community appreciate it. My reading of the situation is that we are in quite a bind. Everybody acknowledges that this contract is problematic. Yet Council–understandably–feels constrained about what it can do at this stage. Our preference is that the contract be disapproved. Yet if that’s not possible, I think there is a palatable solution that might get us all closer to where we want to be. I noticed in the hearing that you indicated that you are open to allowing DCPS to make some modifications to the contract. Some of the language in the contract wasn’t clear or correct, and you asked Dr. Beers for a list of items that would have to be included before the vote on Tuesday, July 12. If you’re open to modifications from DCPS, then I think the most important modification to require would be to bring in one more vendor to serve one cluster. It is my understanding that Genuine Foods remains on the list as a qualified bidder. I do not know (and have long been asking!) who any of the other bidders are. But I am aware that this vendor published their proposal and BAFOs online. Mr. Grosso, it’s a really amazing proposal, in my opinion. Everything Council said it wanted at the hearing, Genuine Foods has: It has five community partners; it already has an agreement with the Teamsters to honor their labor requirements; it already has a written plan for student engagement. They are transparent — publishing even their prices online. And Mr. Grosso, their per-meal prices are significantly less than Sodexo’s, even though they include much more robust standards such as working with local food providers, prioritizing staff training, and increasing participation in schools with the most vulnerable students. DCPS could award one high-need cluster to Genuine Foods, and see how they do. Right now, if Council approves the Sodexo contract and Sodexo violates the terms of its agreement, there is no vendor in place to step in who has been tested and worked within the system, other than DCCK (which has no desire to scale up) and Revolution Foods (which has not performed well in the District or elsewhere — see their many Notices to Cure, from as recently as 2014). Quite simply, we need more breadth. We need a deeper bench. We need at least one more contractor in the mix. Everybody agrees that DC Central Kitchen is sort of the Gold Standard in the school food game. My reading of the situation is that Genuine Foods’ approach is a lot closer to DCCK than Sodexo is, by far. If there are other qualified bidders who could take a cluster, they should be considered too. But this is the easy route. And I think it would be met with widespread approval. Please let us know your thoughts. We would like to see this happen. It’s not too late to get involved in the fight for better school food in the District. Our elected City Council representatives will vote whether to approve or disapprove the proposed contract between DCPS and SodexoMagic on July 12. We’ve got to keep the pressure on them for a vote to DISAPPROVE. On Wednesday, July 6, 2016 the Committee on Education of the DC City Council held a public roundtable to discuss the contract. Over 30 Lunch Ladies from the Teamsters Local 639 turned out along with students from elementary, middle, and high schools; DCPS parents and teachers; and a representative for the wonderful program, FoodPrints. You can watch a recording of the hearing here. We will post copies of each person’s testimony here as it becomes available. In the meantime, PLEASE contact your ward representative and encourage them to vote to DISAPPROVE. We don’t want to just hand over $35.4 million when there are such major problems with the contract. Sodexo is charging way too much, and their track record indicates that the quality and taste of the food served to students will not improve. We’re working to find a “third way” — some way we can avoid handing over millions of dollars to this company but not have to fall back on an emergency feeding plan. But in the meantime, as we work out the details, please contact your Councilmembers and ask them to vote to DISAPPROVE! Please see details on where we are regarding the school food contract, what next steps are to review the details, and what you can do (please get involved!) to ensure $40 million is invested in the best meals possible for DCPS students. It is a promising sign that our concerns regarding the DCPS school food contract are being heard. Members of Council have heard that it is not acceptable to push thru $40 million in contracts so late and attempt once again to evade oversight and scrutiny. Your calls, emails, and tweets made this happen — THANK YOU! But the next steps remain unclear. Council could still approve the contract. And if they don’t, what’s the interim plan? Some schools begin at the end of August and the bulk of schools start in about 6 weeks. FYI, the full contract was not submitted to Council for review, only an introduction representing 13 pages of approximately hundreds for each contract. Also, no details have been released to compare the evaluations and scales used to measure each proposal. We have requested a copy of the contract and full disclosure of details. At the earliest, we may not see the full contract until late today, tomorrow or even later. I’m not sure if the paper trail for the proposal evaluations will be released at all. Oh and this isn’t free. Apparently transparency costs 25 cents a page. We will share these details when/if they are released, so we can all evaluate the terms of the contracts and the selection process. We need a strong showing of support at the Roundtable on 7/6. We need parents and DC residents to continue to call Council, email Council, tweet to Council members, share information on Facebook, and if possible join meetings. Following the round table and the release of additional details, we will followup with revised next steps. Please email me at hillfoodie at yahoo dot com if you plan to testify or submit testimony for the record. It would be great to have kids testify! Teachers too! Unfortunately, I will be out of town, but I’ll do everything I can to prepare in advance. We also know that the procurement process was very questionable. DCPS submitted a school food contract solicitation timetable to Council last September, documenting a timeline spanning gathering initial feedback from stakeholders in September 2015 through approving the contract and referring it to Council 4/18/2016 and starting the contract 6/27/16. According to that timeline, the receipt of best and final offers was scheduled for 3/10/16. That actually occurred 3/30/16, only about 2.5 weeks behind schedule. So at the latest, the contract should have been sent to Council in early May. What is the cause of the three month delay? It appears the vendors were selected in early April. In addition, vendor selection notices went out in mid to late May, but procurement sent out subsequent messages rescinding those notifications, never providing explanations and never holding briefings with vendors that were not selected. In addition to the timeline, we also have questions about the who was represented in the selection process, the evaluation criteria, the evaluation scale, prices proposed by each vendor, labor commitments, vendor history and more. Please stick with us! This has been a long haul. We aren’t done yet. Because of a stipulation in DC city law around the bidding process, the public is not allowed to know which companies have submitted bids. What we do know, however, is that big food service companies are some of the only entities that have the organizational capacity to bid in this very complicated system. One of these big food service companies is Chartwells-Thompson – the Compass Group subsidiary that just settled a $19.4 million whistleblower lawsuit that alleged fraud and mismanagement. (Chartwells-Thompson was recently involved in a bribery scandal in Chicago as well.) Another company that has expressed interest is called Sodexo. Unfortunately, this company has a history of fraud and racial discrimination as well. Students in DC Public Schools depend on breakfasts, lunches, after school snacks, supper, and fresh fruit and vegetables to counter the effects of a rough economy and widening urban income inequality. While some parents are able to send their kids to school with homemade lunches, most are not. As parents, we have to speak up. In our city, where three-fourths of public school students qualify for free and reduced-priced lunches, we have a special responsibility to make sure that each and every child receives the nutritious, delicious meals that will propel them to academic success. We can do this. It’s in our power. That means we have to hold the school system accountable. We have to tell them that huge multinational companies that engage in fraud, bribery, and discrimination have no place at our table. Thankfully, there are other options out there, including local companies that prioritize relationships with anti-hunger organizations like Share Our Strength and the United States Healthful Food Council. With the right team at the helm, DC Public School food can be something we’re proud of. But it’s up to us to communicate these priorities. Let your voice be heard! Use #NotChartwellsAgain and tell us what you want from the leadership at DCPS. WASHINGTON, D.C. – Today, June 8th, in light of the recent settlement between the District and Compass/Chartwells, Councilmember Mary M. Cheh (D – Ward 3), Chair of the Committee on Transportation and the Environment, sent the attached letter to D.C. Auditor Kathy Patterson requesting an investigation into the District of Columbia Public Schools (DCPS) performance and monitoring of its food service contracts. This is not the first time Chartwells has had to settle a suit of this kind. In 2012, its parent company, Compass Group USA, paid $18 million to settle a suit about its improper retention of rebates in New York State. Reports of Chartwells’ financial irregularities and documentation of its failure to abide by the full terms of its contract have appeared for years. At City Council hearings in 2012, parents and community organizations testified about the poor quality of food Chartwells provided and raised questions about the yearly losses the company reported, which had to be covered by DC taxpayers to the tune of around $10 million a year. DCPS commissioned an independent audit of the company in that year and verified that the company was overcharging the city for meals and breaching its contract in other ways. Still, Chartwells has held onto its contract with DCPS. And it appears poised to keep that contract again, even in light of this settlement. Comments? Ideas? We’d love to hear them. Share your thoughts here. We want to hear from you! As the eyes and ears on the ground, share what you are seeing in your school. Are there exciting new menu items at your child’s school? Where do feel more improvement is needed? Who are the ‘school lunch champions’ helping to make a difference? 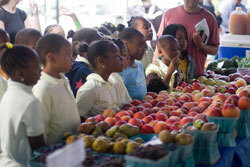 Any innovative ideas on how community members can get more involved in providing access to healthy school food? To share your story send us an email. When they brought the salad bar to Tyler ES, I had the opportunity to volunteer during several lunch periods to help out the students and the staff. The kids were very receptive to the salad bar and really seemed to enjoy the process of serving themselves. I hope that eventually the salad bar will be a daily offering in the cafeteria. A community member from Miner elementary shared this picture of “supper” offered by Chartwells there: a roll, a few slices of cucumber, and some ranch dressing.